is a professionally built racetrack designed for scale diecast vehicles such as Hot Wheels and Matchbox. Anyone can pick and race a car. We have an electronic winner line that determines the winner and the winner gets a prize. We are celebrating our one-year anniversary, In summer 2007. We will be attending many community events fairs and festivals. Look for us at car shows too. Diecast Derby is available for rental for the following events Campground Events such as racing themed weekends, Auto Shows Car Shows and Cruises, Vacation, Bible School, Birthday Parties, Diecast Clubs, Fairs, Festivals, Community Events, Fundraising Events and much more. If you are looking for something to make your next event memorable Diecast Derby is the answer… Children Love Diecast Derby. Official Hallmark "GOLD CROWN" Store. We feature all Hallmark Gold Exclusives. Bowling Alley with full service restaurant & bar. 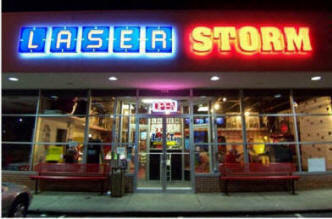 Is a family entertainment center with a large Laser tag arena, arcade and party rooms. team building and tournament level laser tag. Ark Traveling Stuffed Animal Workshop. fundraisers, corporate events and more. it and take it home to love forever. We offer a variety of packages to fit every budget. FREE surprise for the birthday child. Its a glittery good time for girls. We come to your location and set up a glamour gallery. make up, while learning the importance of inner beauty. Contact us for our package pricing. Imagine coming HOME after a long day and not having to think about or work at getting dinner on the table. You just pull out a Ready-to-Cook meal, follow easy cooking directions, (oven, stove-top or grill) and dinner is ready when you are. Stop paying high prices at Restaurants, in a noisy atmosphere surrounded by people. Cook and eat in the Comfort of your own home! Customers can come into our Studio kitchen and assemble their own meals or we can assemble meals for our customers by pre-order, or stop it to see what we have--Our Grab-N-Go Freezer is always filled! You probably think this service is expensive? Three people can eat for as low as $9.50 when our meals are bought in quantity. A single meal for three will cost no more than $15.00. Another great thing about our meals is the portion control. Our Boneless, skinless IQF chicken breasts are 4 ounce size, the recommended dietary amount. So are our boneless center-cut pork chops, tilapia and salmon fillets, etc… Are you hungry yet? Our meal directions usually suggest healthy sides, like salad and vegetables, instead of starches. Nutrition information is available online and at our store. Super Suppers. We provide refreshments while our guests assemble meals to take home and enjoy. Online retailer of costumes and accessories for children, teens, adults, and dogs. Offers holiday costumes, superhero outfits, theater costumes, and more. Discount Halloween costumes is the name of the game here at Costume Discounters. and accessories. Costume Express is part of the Celebrate Express family of party brands. kids costumes, Halloween masks and Halloween wigs. wigs, masks, makeup and props. Kids Birthday Party Themes Birthday Party Supplies for any themed birthday party there is.